So, like I said yesterday, you have to respect the marathon distance…..
Clay’s family picked me up early this morning and we headed down to Dodger Stadium for the 28th running of the Los Angeles Marathon. I was hoping to find some friends over at the Union 76 Ball next to the old Dodger Stadium gas station. I got there and found Chuck, Lance and Dave Hoglund waiting for me. We did not hang out long as restroom lines were calling and there were chutes to get into. 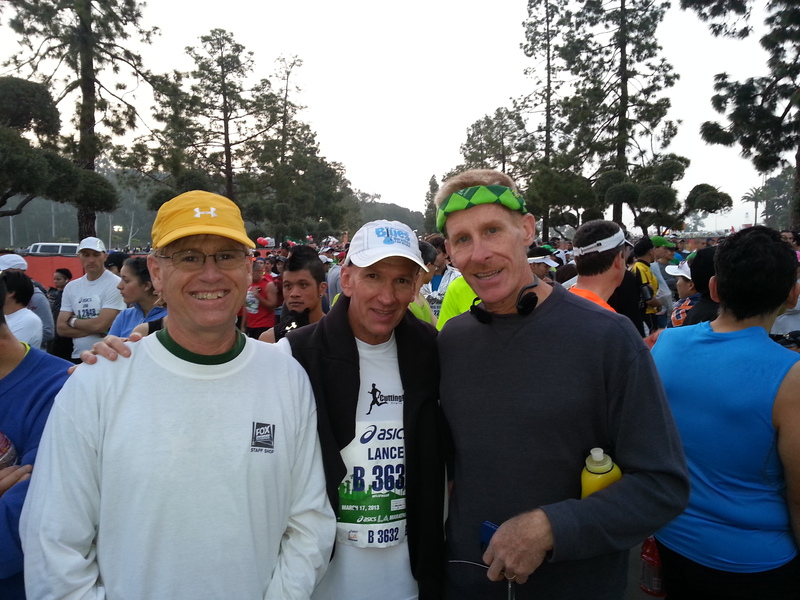 Lance, Clay and I found our way into the sub 4 hour corral. Dave tried unsuccessfully to sneak in with us. Chuck found his way to the start of the next corral. As the race started, we were right in the middle of the road and it seemed that we were not moving very quickly. The course rises a bit and then drops sharply out of the stadium and down into LA. A bit more than a mile into the race I spotted Chuck out ahead of us. Somehow, he had taken off along the side and gotten ahead of us! Clay and I pulled along each side and he joined us! The three of us hung together for a few miles anyway, and then Chuck dropped behind. Right after Chuck dropped back I noticed Dave passing us. I called out and we chatted just a bit. Dave was trying to qualify for Boston. He is 59, but will be 60 at the next Boston. He said he needed a 3:55 to qualify. I left Clay and went with him for a bit, but on the big downtown hill, he pulled away. I pulled back and within another mile Clay was with me again. By mile 5 or so I was already feeling some soreness in the left knee. I was also beginning to experience the development of a big blister on that same left foot. 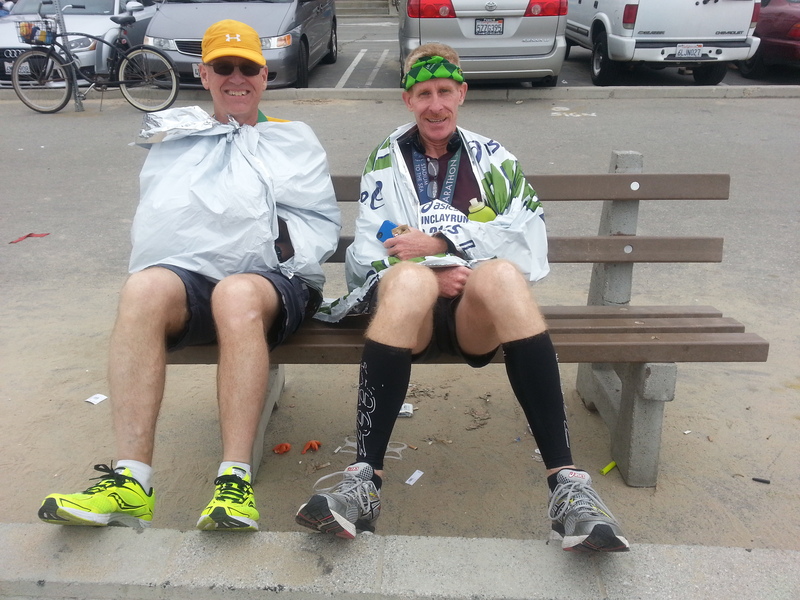 This was the same spot I had one at the OC Marathon a couple of years ago. I don’t typically have blister problems so I am not sure why I got one today. As we ran, Clay mentioned that his family was supposed to be on the course at around 6 miles. With my achy knee and developing blister I thought maybe I should just go with them – dnf – for the first time. I thought about it for awhile and finally said something. Clay said he was thinking the same thing! So we ran and looked for his family – they were no where to be found. 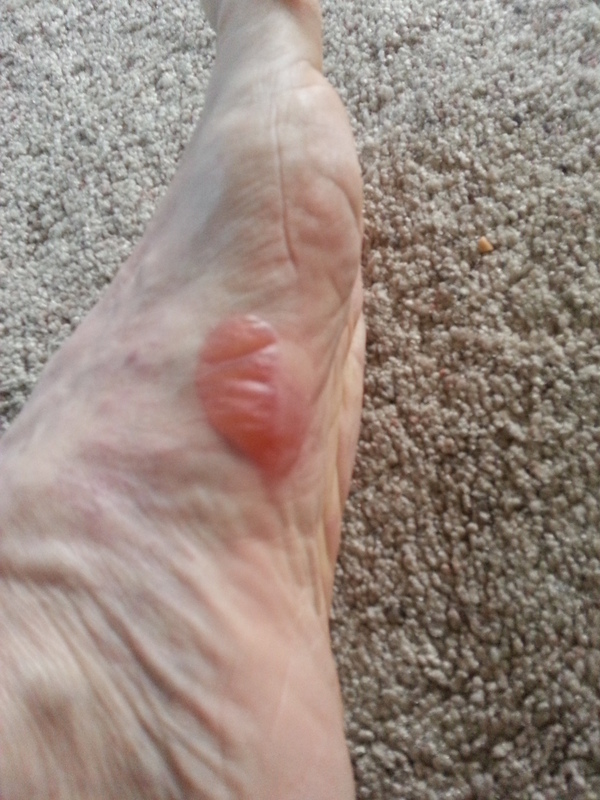 Here is the blister after 26 miles, at least it did not bleed…. A mile or two later, I decided to make a quick pit stop. Clay said he would walk and wait for me. I was really quick in the potty and out the door. The adrenaline of playing catch up must have hit. I ran along at sub 8 pace. I thought I saw Clay up there, but he was not walking. Still, I caught him, but it was not him! After a couple of miles I realized that I must have passed him. I called his cell but he did not answer. He texted back his location and I was indeed well ahead of him. I set the timer function of my watch to beep every 10 minutes. I figured I would take a regular walk break every 10 until Clay caught me. He never did. Somewhere around Rodeo Drive I heard some familiar voices as Joe Kim’s family was out there cheering for me. (Two of Joe’s sons run or have run for me.) 5 or 6 minutes later it occurred to me that I had just missed another chance to quit! I ran onward continuing the 9 to 1 pattern. As the miles neared 20 the walk breaks sometimes got longer. The course has a pretty good hill the 21st mile through the Veterans Administration. I did some considerable walking here. The last few miles are nice gradual downhill. I took a couple of longer walk breaks and did a couple of longer run surges as well. Finally, I came around the final corner and ran that last half mile or so to the finish. I was finished in 4:08:11. One of the reasons for some of the longer walk breaks was that I was checking my cell phone. I had signed up for text alerts for Lance Close, Eric Ruble, and Krysti Ruble. I was checking on their progress hoping to see some BQs. After 10K I got texts stating that Lance was on a 3:13 pace, Erik a 3:28 and Krysti a 3:57. After 20K Lance was still at 3:13, Eric 3:15 and Kristi 3:45. At 30K Eric had moved ahead at 3:18 pace. 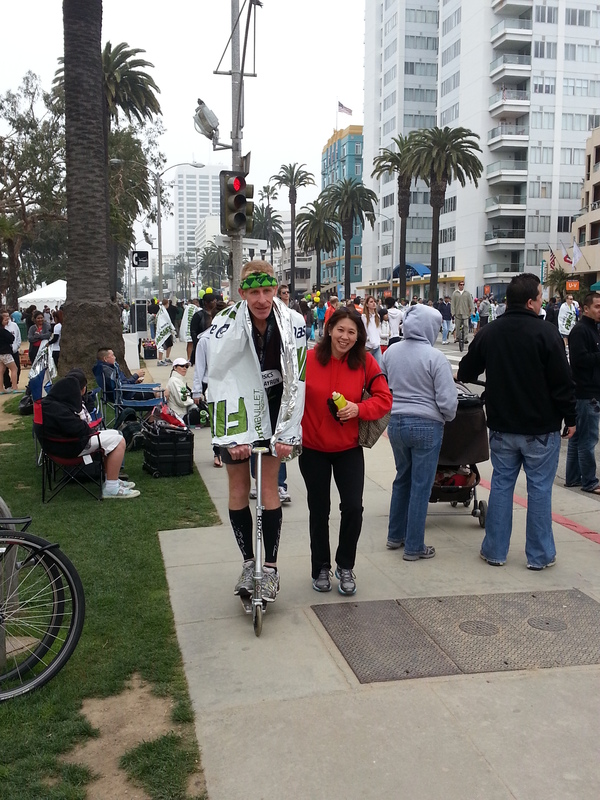 Lance had slowed to a 3:23 average and Krysti was at 3:56. It looks to me like both Eric and Lance may have started too quickly. After the marathon I waited a bit and I saw Krysti and then Clay. Clay and I had to wander a bit to meet up with his family. Here we were waiting on a bench. We must have looked pretty pathetic. A young lady happened by and asked if she could take our picture…. After Clay’s family found us, Clay had a little assistance getting back to his car……. no fair……..
How did the blister look after 26.2 miles? Hopefully you did no further damage to your knee. Good job hanging tough and finishing your 15th marathon. Best wishes on a quick recovery. The pic is after I got home…. ← Not so sure about this…..